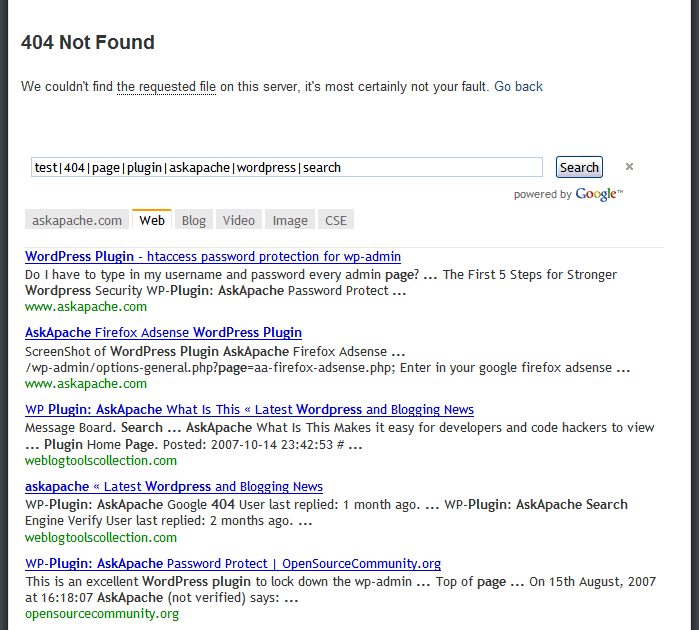 Announcing a major update to the AskApache Google 404 Plugin for WordPress, still only a 5 second install! Now includes a customized version of a 404.php WordPress template file and will automatically use this custom 404.php file if you don't already have one. Visitors who travel to a non-existant URI on your blog will be shown this super-user-friendly ErrorDocument and they will most-likely locate what they were originally searching for. The second more experimental traffic driver comes from attaching your blogname to every search query made to each of the Google Search Indexes using an OR blogname request. 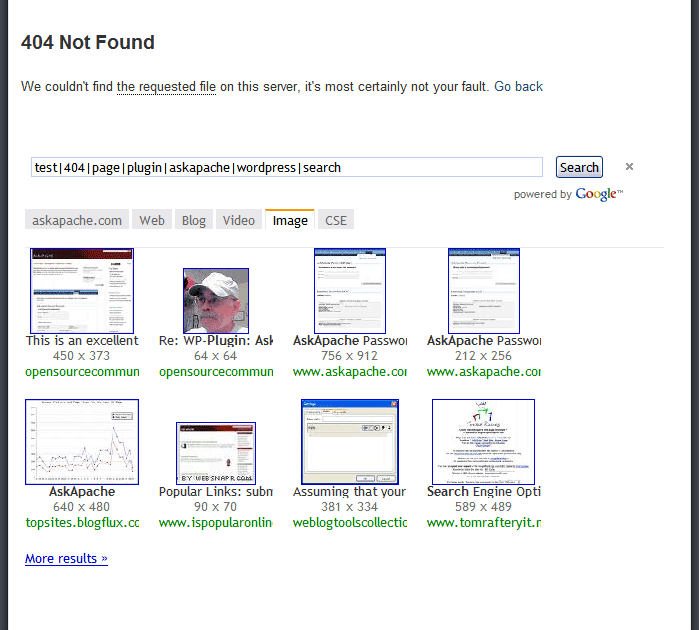 My hypothesis is basically that every time a visitor sees your 404 page, a search query is sent to each Google Index. This may not sound very exciting, but here is why I think it is very exciting. It is common knowledge that searching for your site in search engines repeatedly helps them to index your site and may boost your ranking, but 1 person doing that doesn't make much of a splash. 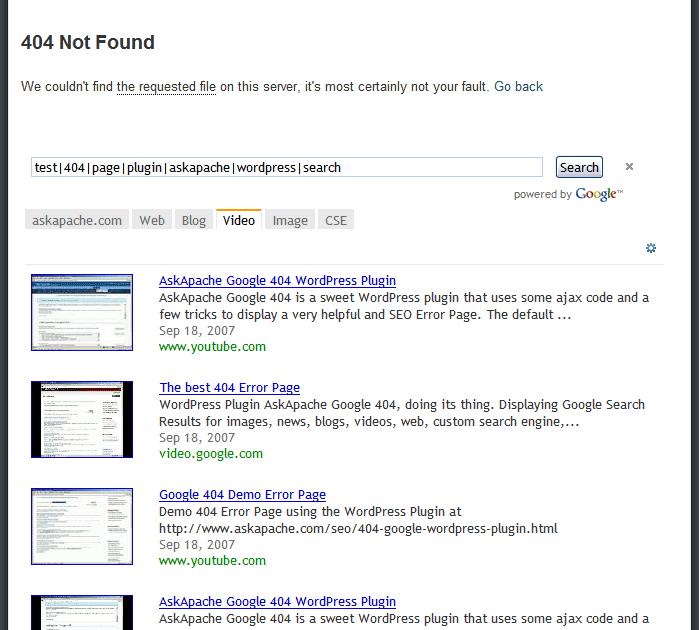 This plugin turns every 404 Not Found event on your blog into a SEO traffic generating event! Now you have many unique users with unique IP addresses and cookies searching for your blogname on all of the Google Indexes... Sweet. Wait.. It gets much better... Providing highly relevant search results to your visitors is the highest priority for this plugin in order to help them find the requested resource as fast as possible. In order to that this plugin takes the requested URI and massages it into a list of keywords. These keywords are then used to query each of the google indexes, but to make sure the results are related to your blog, and to make sure Google starts to recognize certain common related keywords for your site, the blogname is also attached to the search! Click ImageTake note of the Link URI and what is searched for on Google. NOTE: not everything is obvious, some things are hidden. Search the Image, Blog, Web, Video, YouTube, CSE, and Site Google Index's automatically. 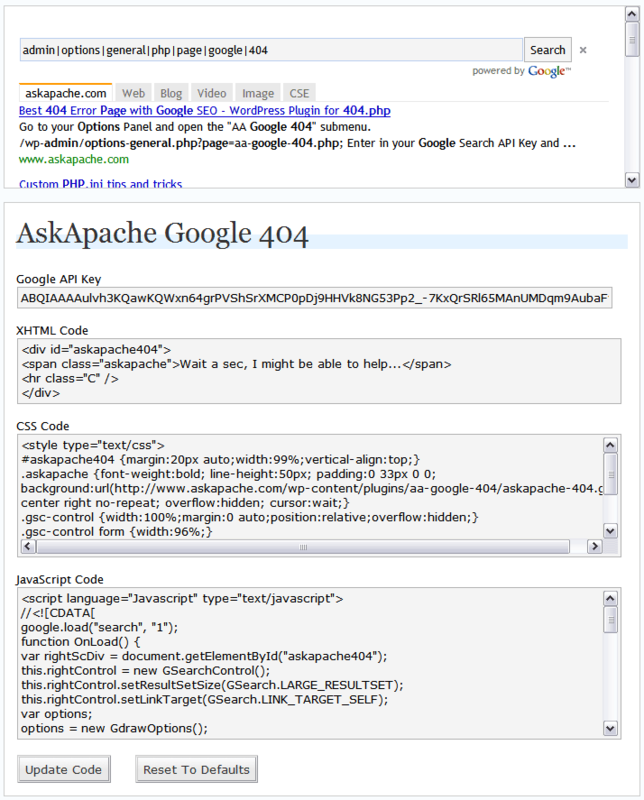 Using the Google AJAX API.